Hey guys, I'm Will from Skunkape. I thought I would share with you an overview of the process I used to create DENIZEN's "Banshee" (front and back view shown below). 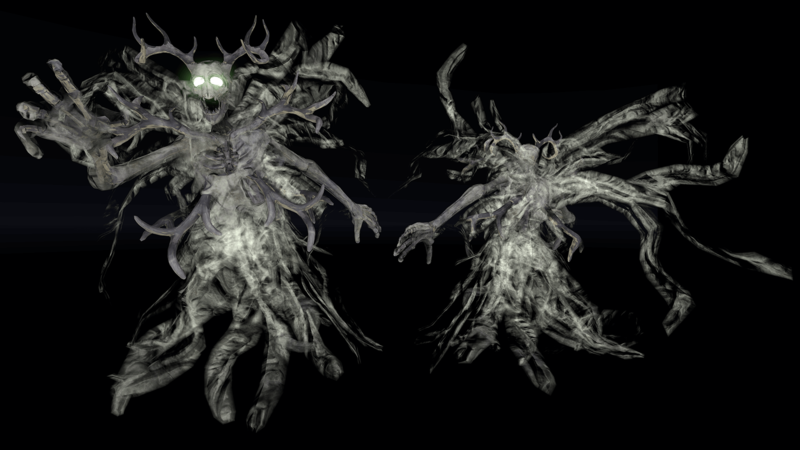 The Banshee is a hostile forest spirit that floats and attacks the player from range with spells: a stream of small projectiles, a large projectile, and when the player is near enough a psychic shockwave attack. Banshees are common, especially in the swampy areas of the forest and can appear out of thin air. One of a Banshee's functions is to keep travellers who have been consumed by the swamp from rising out of the muck. These traits informed their visual design. So here's what was involved with my end of the design process, 3D artwork. Since I knew this character would be a bit humanoid (he's got arms and a head) I started with a default human model included with ZBrush. I don't always use it but when I'm making a character who's roughly humanoid this is the best way I've found to optimize my time. If you use Zbrush you can use the same ZTool to start your characters. It's probably in C://Program Files/Pixologic/Zbrush/ ZTools/NickZHumanMaleAverage.ztl. It's a very useful resource. 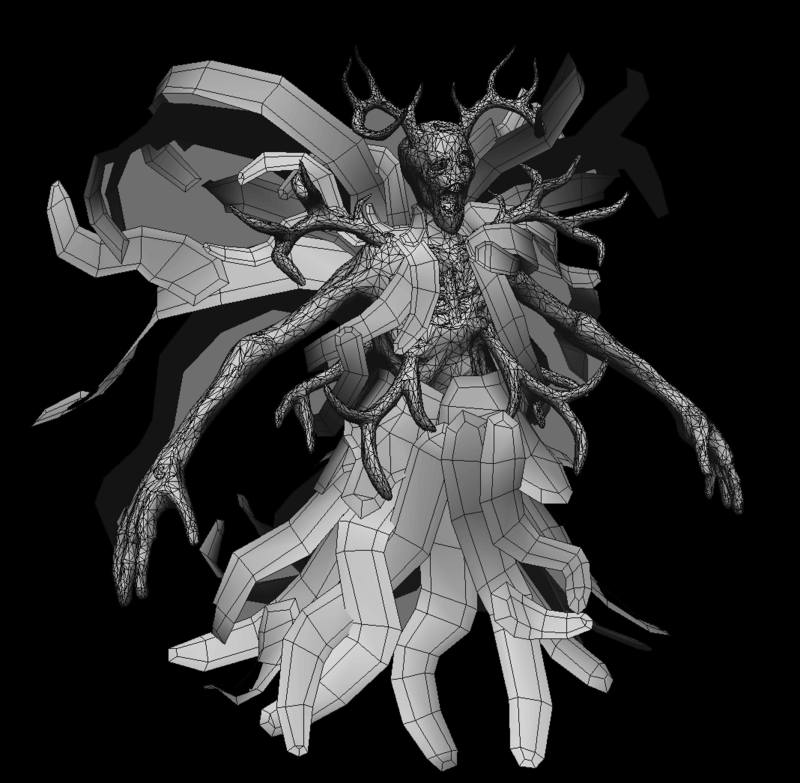 Once I opened up the ZTool I exported it as an .obj to take it into Softimage, where I quickly mangled it and removed his ears, nose and legs to make a starting point for our monstrous Banshee. The result is the far left panel of the image below. Then I took this mess back into Zbrush and began to sculpt on it with Dynamesh. Dynamesh is great for working fast and creatively but has the downside of being unusable for game topology, which means the game mesh will have to be rebuilt later. I only use a few brushes, mostly "ClayBuildup", "Smooth", "Dam_Standard" and "Inflate". "Crumple" is also useful for adding detail at the end. 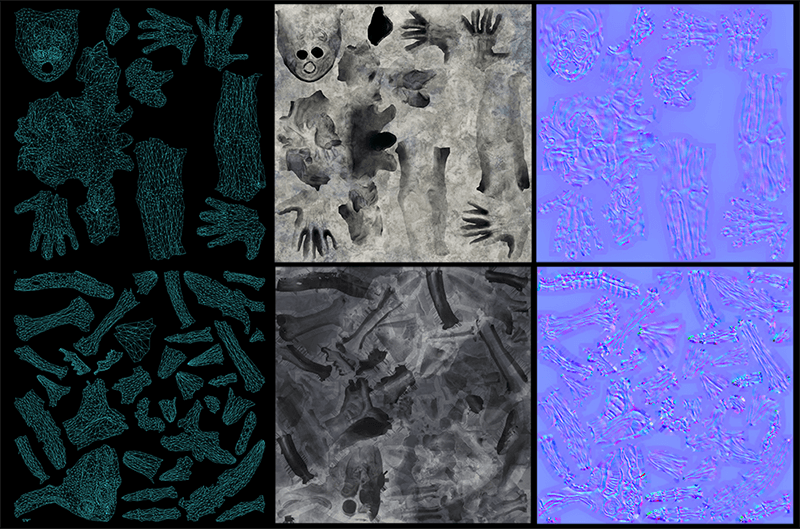 After several hours of iteration I had results I was happy with, pictured in the far right panel. The Banshee has bones protruding out of it's body. The starting point for the bones was another ZTool included with Zbrush in C://Program Files/Pixologic/Zbrush/ZTools/Ryan_Kingslien_Anatomy_Model. Since I use these two ZTools alot I took some time awhile back to match up thier scale and pose, which makes sculpting creatures with gory protruding bones quite easy. You can see the progress of the skull below. I used the same process, started with a human skull, Dynamesh and iterate with the same simple brushes, although this time the "SnakeHook" brush was very helpful for the horns. I also added horns coming out of the shoulders and the rib cage to create a more unique / grotesque shilloette. After the character's body sculpt was done I had to create a low detail version for use in the engine. I also wanted to add some whispy tendrils to give him a more engaging, demonic look. So I used "Decimation Master" to grab a rough low detail version of the mesh. Then back in Softimage I created the tendril geometry using simple tools like "Add Polygon" and "Duplicate/Extrude Single". 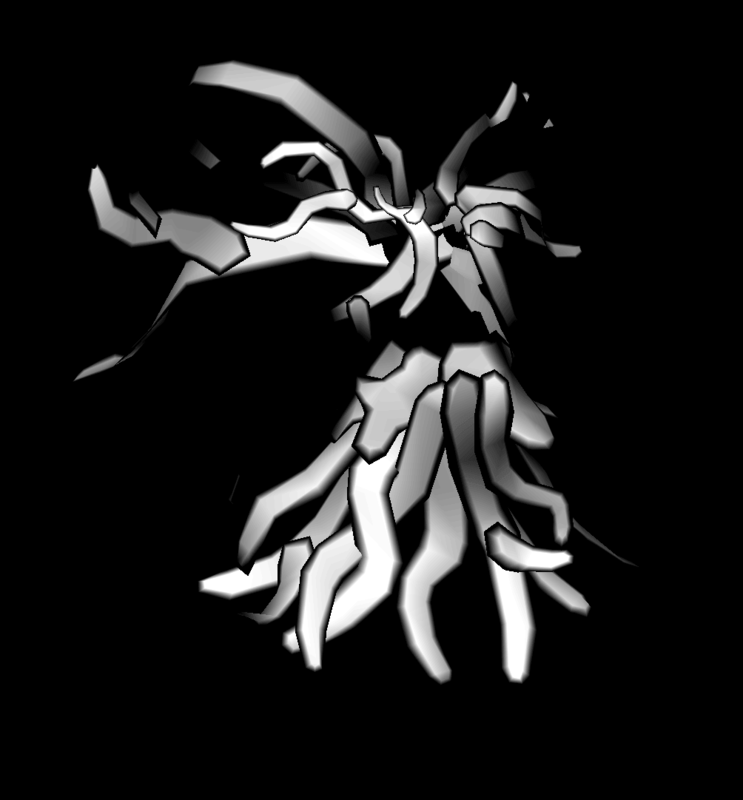 When the tendrils were finished I started building from the mesh created by Decimation Master. The topology needed some cleaning to make it easier to animate and UV unwrap, nothing more complicated here then "Delete" and "Add Edge Tool". In hindsight I could have done a more thorough job of retopolgy, but my quick job is working fine. From my experience Headus UV Layout is the easiest and fastest way to create UV maps, it is very smart and can flatten meshes very fast and with minimal distortion, although it takes some getting used to. After the unwrapping of the body and horns was done I grabbed normal and ambient occlusion maps from the original Zbrush mesh using XNormal, which is another great tool and renders faster than anything. The ambient occlusion map is a good place to start for the final texture. I simply add grunge from photographs underneath using Photoshop. That's probably my favorite part of the process. 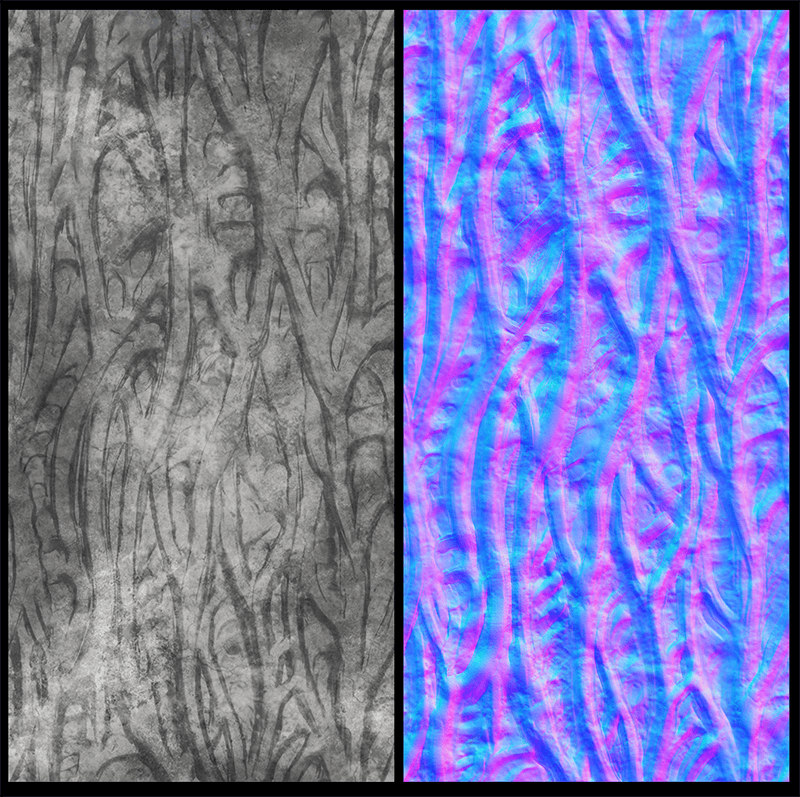 For the normal map, I like to use this trick: duplicate the map to a new layer and set it's blend mode to "Overlay". This makes the shading from the map seem deeper. Combined with a mask created using a soft brush you can add some interesting enhancements to your normal maps. So finally here in the image below you can see the maps for the Banshee's skin on top and horns at the bottom. 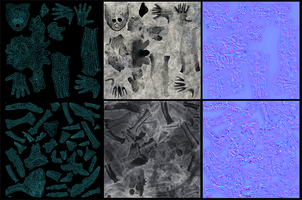 The left panel is the UV layout, the middle is the color, and on the right is the normal map. The reason they are seperated into two maps rather than one is because the skin uses a trasparent shader but the horns are opaque. That's about it! I hope you enjoyed reading about realtime 3D art. If this is interesting to you or you would like to ask me a question about something that I didn't explain very well feel free to tweet me @sa_eenglish or message Skunkape Interactive here on IndieDB. Have a good one! For further updates on DENIZEN and to be notified when playable builds are available, please subscribe to our mailing list!